Familiar with the standard VideoGhost? The VideoGhost Pro and VideoGhost Max are enhanced versions with control capabilities over Virtual COM and hardware COM. An external application can capture still images on-demand from the monitored DVI, HDMI, or VGA interface. 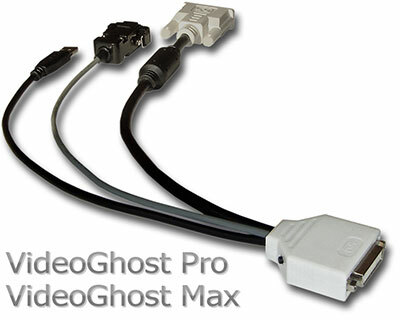 The VideoGhost Pro/Max can act as a Mass-Storage device, a Virtual COM, or even as a classic RS-232 serial device. An external push-button accelerates standard operations, such as screen capture or mode switching. The VideoGhost Pro/Max are highly customizable solutions, delivered with source-code examples easing the integration process into other systems. Want to learn more? Read the VideoGhost Pro/Max User's Guide or simply ask us. Flash Drive mode is available just like in the standard VideoGhost. Recorded screenshots are stored in the JPEG format and may be accessed similarly to a digital camera. 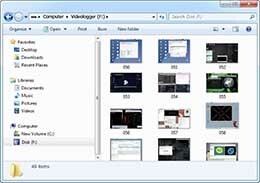 The video-logger will pop-up as a removable drive, containing captured screenshots as JPEG files. The files will contain embedded time and date information. A true hardware COM interface is available with the VideoGhost Max. 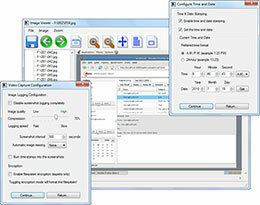 It offers the same features as the Virtual COM (with exception to transfering entire images). 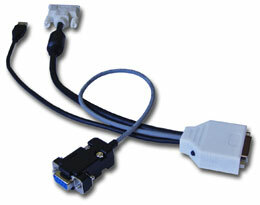 This allows an external device to control the VideoGhost Max, for example using the RS-232 protocol.